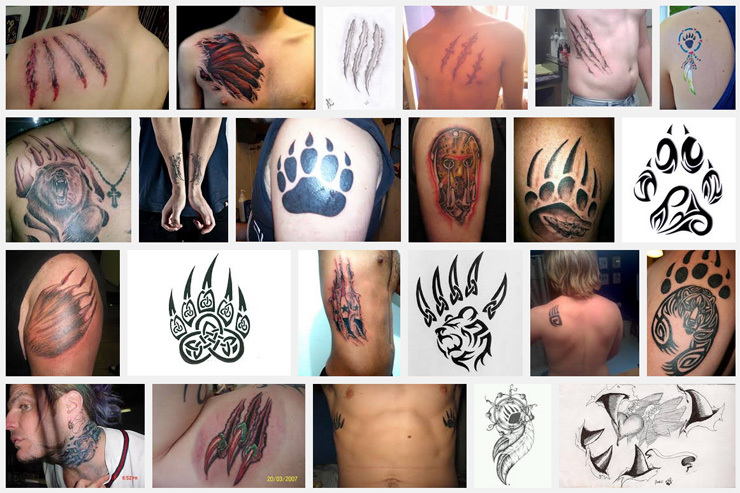 Deciding on a claw tattoo design can be tricky - there are so many to choose from! 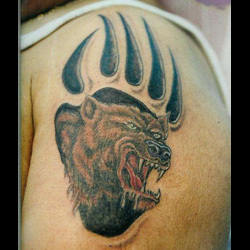 Much of the symbolism of this tattoo will derive from the animal whose claws you're representing. From bear to dragon to panther, these animals all have intense symbolic meanings that stretch across time and cultures around the world. The bear claw is one of the most prominent claw tattoo designs - but no, this tattoo isn't of a delicious breakfast pastry! Native American cultures have long revered the bear for its strength, power, and warrior-like nature, and the bear is a popular totem animal among many Native Americans. The bear is free in spirit, but this trait can also be coupled with unpredictability. As the saying goes: don't poke the bear! The bear also has a gentle, maternal nature: mother bears will protect their cubs with ferocity, making the bear a symbol of protective parents. Eagles also serve as important creatures in Native American cultures, where they represented the physical manifestation of the great Thunderbird spirit. This spirit could shoot bolts of lightning from the eyes of the bald eagle, and a flap of its wings would bring powerful rainstorms. This connection to nature is an important quality of the eagle, making an eagle claw tattoo a great choice for someone who cares deeply for nature and its creatures. In popular American culture, the eagle is also a national symbol, making eagle claws a great tattoo choice for any patriotic American; indeed, it is particularly popular among current and former servicemen and women. Dragons are one of the most prominent mythological creatures, and their symbolism abounds in both ancient and modern culture. Though tattoos are often gender-neutral in their meaning, the dragon is one exception. On women, dragons can represent how woman is the ultimate creator of life, as well as the immense power that is underneath the surface of her outward reserve and gentle appearance. On men, a dragon tattoo can represent a combination of wisdom and power: they are both revered and feared. Dragons also have appeared in mythologies from around the world. For instance, in various folklores from Europe, dragons were the ultimate foe of brave knights, who had to slay this beast in order to rescue a princess, save a kingdom, or to finish a quest. In many Asian cultures, the dragon is a water animal that symbolizes meditation and the subconscious. While wolves themselves are becoming more mainstream tattoos, do something different by having just its claws tattooed on your body. The symbolism of wolves is recognized the world over: they are strong, intelligent creatures that hunt best when in packs. This independent, yet social creature is closely related to the dog that many of us love as pets, and can therefore represent how close we ourselves are to the wild. Within ancient cultures, the wolf was an especially potent symbol in ancient Rome, whose founders, Romulus and Remus, were raised by a she-wolf. In Celtic symbolism, the wolf is closely connected to lunar power, as Celtic mythology contends that every evening the wolf would hunt down and devour the sun in order to let the power of the moon to shine through. 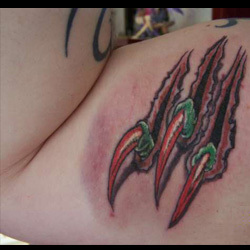 Another great animal claw tattoo is that of the panther. This graceful yet ferocious creature is especially prominent in the cultures and mythologies of Central and South America. In many of these cultures, the panther was considered to be a familiar animal to the Shamans, and as a totem animal the panther was symbolic of the nobility and authority of the royal families. The panther's complex and intricate body, consisting of over 500 voluntary muscles, also makes this animal a great personal symbol for anyone who is dedicated to health, fitness, or simply keeping their mind and body in perfect harmony. 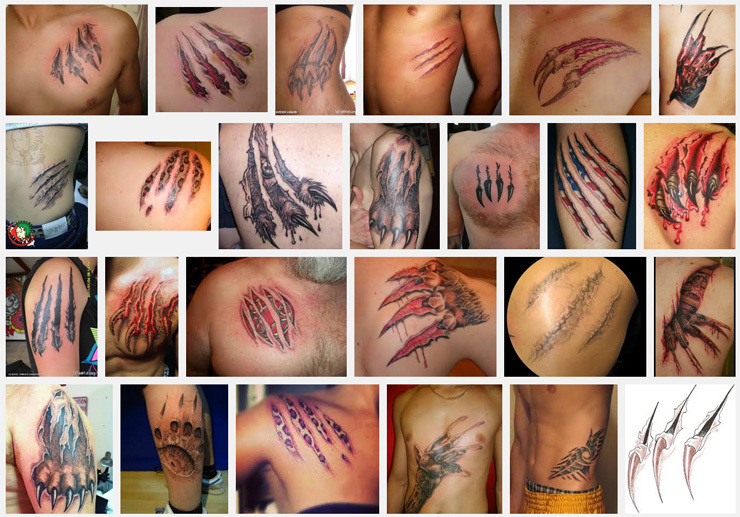 There are numerous claw tattoo variations which depend on the animal you want to represent, and any cultural or symbolic meanings that animal has. Below are some great ideas for your claw tattoo, many of which will allow you to incorporate your own unique personality into the design. 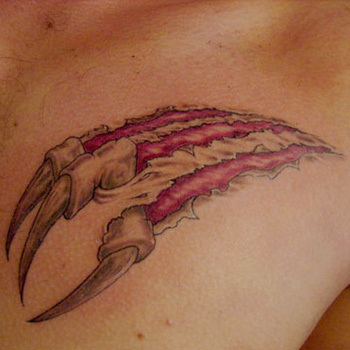 Getting a tattoo of a bear claw can symbolize several different traits, from maternal instinct to being free of spirit. One variation of the bear claw design is to get a bear paw with prominent, sharp claws - this is often black, though obviously you can choose any color to suit your own design and style preferences. This paw/claw print can also be done in the style of a footprint, with careful shading creating the appearance of a 3D-like indentation in the skin. Another option is to incorporate an image of a bear with its claws out into the foot of the paw, with the toe pads and claws done as normal - this will help others recognize what animal your claw tattoo represents. To connect your bear claw tattoo with Native American culture and symbolism, include tribal or totem symbols in your design, such as using a tribal pattern to make the toes. Getting an eagle claw tattoo is a great way to demonstrate your connection to Native American and/or American culture and nationality. 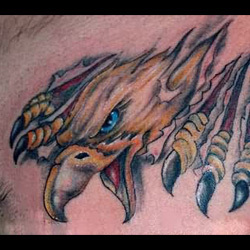 To emphasize the eagle's importance in Native American symbolism and mythology, the claw of the eagle can be done in a black, tribal style, or an eagle totem with prominent claws can be designed by you and your tattoo artist. One popular design used to demonstrate American patriotism is to have the eagle claws ripping through the skin to uncover an American flag underneath. Alternatively, a similar design sees the eagle's talons decorated with red, white, and blue as they rip through the skin. The variations of dragon claw tattoos are numerous, and can incorporate different cultures, ideologies, and meanings. If you're looking for a more ancient, tribal style in your tattoo, one popular dragon claw tattoo design creates the image through block outlines to create a single claw along the side of the hand where the thumb and forefinger meet. To demonstrate an aura of power in your tattoo, another design has dragon claws cutting up and out through your skin; add some precise shading to give this design a 3D effect. The mythical nature of dragons mean the claws themselves can come in whatever color or style that suits you - from bright pinks and purples to more traditional greens, from two-toed dragons to four-toed, the final design is up to you. Just be sure to include some realistic scales to really emphasize the dragon effect. Getting a wolf claw tattoo will set you apart from others getting wolf tattoos, and the different design possibilities will ensure that your tattoo is unique and personal to you. One way to incorporate the wolf mythology and symbolism of Roman or Celtic cultures is to have Latin or Gaelic lettering beneath the tattoo, maybe of your name or of a certain trait of the wolf that you embody. If the word is short enough, the letters could even serve as the toes of a wolf paw print, with the claws prominent above. To emphasize that claw tattoo is that of a wolf, design your tattoo to include a wolf image: this might be done by having the wolf in the background of a paw and claw print design, or by having claw marks reveal an image of a wolf underneath the skin. 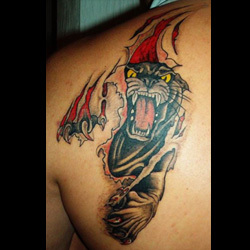 The panther is highly symbolic in Central and South American cultures, and getting a panther claw tattoo can be therefore be representative of your heritage or of a place and culture to which you feel a strong connection. Having panther claw marks opening your skin to reveal a tribal symbol or design underneath is a great way to incorporate the panther's cultural importance. To ensure that people know which animal your claw marks or paw and claw prints are representing, include a whole panther into the design: you can accomplish this by having a panther inside the paw and claw prints, or by having the claw marks tearing through the skin to show a panther underneath. Whichever animal claw you choose, this tattoo provides ample opportunity for putting your own unique stamp on a design. The cultural and mythological importance of animals means that getting a claw tattoo can demonstrate your heritage, important traits you embody, or your affinity for a certain culture. 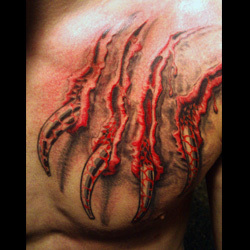 For custom design of a Claw, you can check our Custom Tattoo Page.